Come on Lou… give your head a shake! 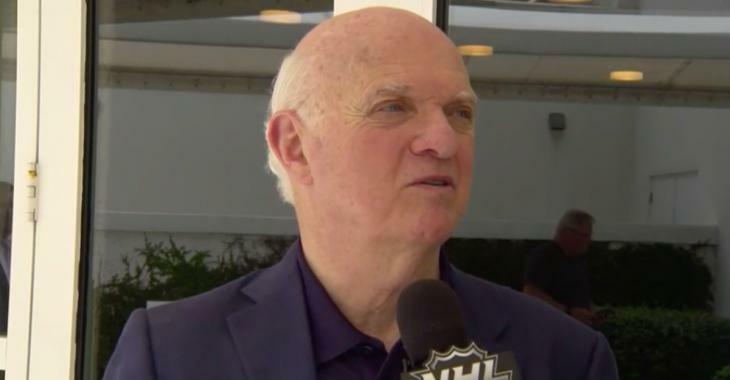 Thirty of the NHL’s general managers are in Boca Raton, FL this week for their annual GM meetings where they’re discussing the state of the game, potential new rules and of course, reviewing the current rules including goaltender interference. Goalie interference and the coach’s challenge on goalie interference has been a hot button issue in the NHL this season with several blown calls earning major media attention. Of course, Toronto Maple Leafs fans know all too well about this. Earlier this month the Leafs lost a 5-3 decision to the Buffalo Sabres due to a RIDICULOUS non-call on Leafs goaltender Frederik Andersen on the Sabres’ 5th goal of the evening. As you might imagine, Leafs head coach Mike Babcock was LIVID when the officials made the call. I’m no expert at reading lips, but I’m willing to bet that there were more than a few “F bombs” in that tirade for the officials. After the game however, Babcock was a little more subdued, but still clearly frustrated with the lack of consistency in the NHL’s stated rules regarding goalie interference. “What I don’t like is that the report that came out from the league is different than what [the officials] told me. They told me he was interfered with outside the paint, which is not true,” said a ticked off Babcock. Well, it appears that the NHL heard Babcock loud and clear as goalie interference has been on the agenda on back to back days at the GM meetings. Surprisingly though, Babcock’s colleague, Leafs GM Lou Lamoriello, doesn’t seem to feel that there’s much of an issue. “I think the process is working well. I think we have to be careful because we do have a rule book and remember that the rule book does allow for judgement,” said Lamoriello. The process is working well? Ask Andersen or Babcock if the process is working well. Or how about Cam Talbot of the Edmonton Oilers? Remember his obscenity laced tirade from earlier this season after getting burned on a brutal non-call? Just last week Dallas Stars captain Jamie Benn openly mocked the NHL for blowing a goalie interference call when a beautiful goal, albeit against the Leafs, was taken away from Pittsburgh Penguins defenceman Brian Dumoulin. So, to say that the process is “working well” is bordering on delusional. The system is broken. Hopefully the GMs can come to some sort of definition as to what exactly constitutes goaltender interference or there could be some seriously ugly calls in the playoffs this season. As they have for each game over the past month, the Toronto Maple Leafs will take to the ice tonight without injured centre Auston Matthews. The young superstar hasn’t seen any game action since February 22nd when he suffered a separated shoulder courtesy of New York Islanders forward Cal Clutterbuck. Since then Matthews’ injury has progressed to the point where he’s a regular in Leafs practice, but still not quite ready for game action. Matthews has already been ruled out for tonight’s game against the Tampa Bay Lightning, making it the 20th game this season that he’ll miss due to injury. In his latest column for The Athletic, Leafs insider James Mirtle highlights Matthews’ injury and examines just how it could benefit the Leafs moving forward. You see, by sitting out for such a long stretch, Matthews is unlikely to hit many of his performance bonuses this season, saving the Leafs potentially millions of dollars in cap space for 2018-19 and beyond. According to a source with knowledge of what's in Matthews' contract, he is likely to miss out on the majority of the bonuses in his entry-level deal this season due to all of the injuries. While he will earn $850,000 in Schedule A bonuses, he will almost certainly miss his $2-million Schedule B bonus. Had Matthews not missed 20 games and counting, he’d almost certainly be amongst the league’s top 10 scorers and have earned himself a cool $2,000,000 for his efforts. That cap ding would roll over to next season, further hampering the Leafs’ ability to re-sign pending free agents like James van Riemsdyk or Tyler Bozak. On top of Matthews’ $850,000 bonus for this season, the Leafs will also owe bonuses to Mitch Marner in the same amount and William Nylander in the amount of $637,500. All together these amount to a $2.34 million cap overage which will be applied to next season. That’s a pretty healthy chunk of change, but it could have very easily been $4.34 million had Matthews earned his big bonus. It’s very likely that this would have cost the Leafs any chance at re-signing JVR, for instance. In fact, that $4.34 million is higher than JVR’s current salary and nearly 75% of the $6 million salary that it’s believed he’ll command on the open market. With just $2.34 million in bonuses being paid out this summer and with Joffrey Lupul’s $5.25 million coming off the books, it’s not unrealistic to think that the Leafs could bring JVR back, should they choose to do so. They could also use the money to pursue a top four defenceman, either on the free-agent market or via trade. Vancouver Canucks defenceman Chris Tanev and his $4.45 million salary seems like a perfect fit. Regardless of what the Leafs decide to do with their newfound cap space next season, there is still one way in which Matthews could mess it all up. He still has a $2 million performance bonus for winning a major award. While the Hart, Richard and Selke all seem like a long-shot, we’re willing to bet that Leafs fans would be happy with the team paying out a $2 million bonus for a Conn Smythe Trophy win. Yeah… pretty safe bet there.